Drug overdoses climbed last year in New York, with many death attributed to opioids. 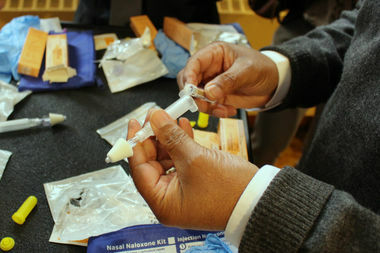 Here, a Bed-Stuy resident learns how to administer naloxone, a life-saving drug that can stop an opioid overdose, at a training session. NEW YORK CITY — Fatal drug overdoses climbed drastically last year, increasing among all demographic groups and in almost every neighborhood, new data from the city’s Department of Health shows. White men between 45 and 54 years of age were the most likely to die, the report says. 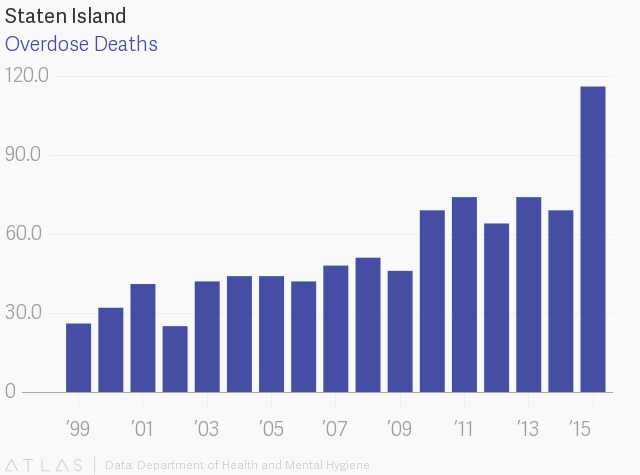 A total of 1,374 people died in drug overdoses last year, a 46 percent increase from 2015, the newest DOH data reveals. In a report released Tuesday, the agency said deadly opioids are to blame for many of the deaths; the data shows heroin and fentanyl — a synthetic opioid 50 to 100 times stronger than morphine — were found in 55 and 44 percent of overdose cases, respectively. “The final overdose data for 2016 confirm what we have feared — drug overdose deaths have reached a record high and are increasing citywide as the opioid epidemic continues to affect every community,” said DOH commissioner Dr. Mary T. Bassett. The South Bronx and Staten Island were hit the hardest by overdose deaths. Highbridge, Morrisania, Hunts Point and Mott Haven topped the list of neighborhoods with the highest rates of drug overdoses in 2016, the statistics show. South Beach and Tottenville in Staten Island also appeared in the top five neighborhoods for overdoses. Overall, Staten Island has the highest per capita rate of overdoses among the five boroughs, though The Bronx had the highest total number of deaths. Overdose rates in 2016 were highest among white New Yorkers, with a rate of 18.9 deaths per 100,000 people. The rate among Latino and black New Yorkers was 16.9 and 12.3, respectively, the report says. Deaths were most common among men (77 percent of overdoses claimed male victims) and people between the age of 45 and 54, according to the report. To combat the increasing numbers of overdoses, the city is encouraging residents to carry naloxone, a drug that can stop the effects of an opioid overdose as it’s happening. Emergency responders in the city already carry the drug, which as of May has saved 140 people citywide since 2014, the most recent statistics from NYPD show.